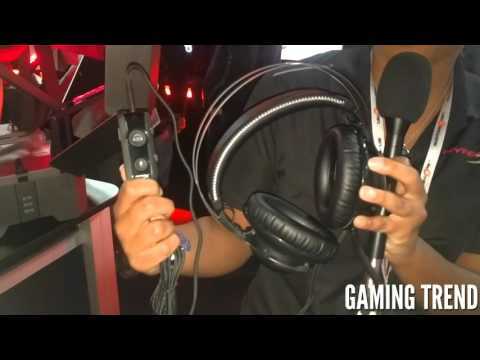 We got a personal tour of the Kingston booth at PAX South and two headsets caught our eyes (or more accurately, our ears). The first one was the HyperX Cloud II for PlayStation 4 and PC. Sporting 53mm drivers and noise cancelleing, the headset rocks 7.1 surround sound. It also can be used on the Xbox One with an adapter. Check out this video to hear all the features directly from the source, as well as a good look at it with some sense of scale. We also got a look at an upcoming product that will work on any platform — the HyperX Cloud X. The Cloud X takes the need for an adapter for the Xbox One out of the equation, allowing it to work on PlayStation 4, PC, and Xbox One. It also gets a new paintjob to match the paintjob of the Xbox One’s Elite controller, sporting silver and black. Check out our brief look at the HyperX Cloud X, which should be hitting shelves soon.